London Design Festival: data streams from all over the city are visualised on the faceted surfaces of Japanese/British designer Keiichi Matsuda's installation inside the cupola of the V&A museum for the London Design Festival. Commissioned by Veuve Clicquot, the Prism installation takes live information including wind speed, air pollution levels, traffic updates, the number of cycle-hire bicycles currently in use and even the energy consumption of the prime minister's residence, then represents it with graphic patterns to create a "live patchwork of London," explained Matsuda at the press preview on Friday. "You see them in totality as a sort of lens into the second city that you don't normally see, but which surrounds us every day." He asked a network of programmers and interactive artists to choose a data source from his list, then draw inspiration from the collections at the V&A to create a texture responding to that source. The cupola has never been open to the public before and visitors enter the installation via a discrete door in the corner of the ceramic galleries, which leads to a narrow spiral staircase, along a landing past the back of a lower dome and up into the tower. They can then ascend past the Prism to the highest point of the museum for a 360-degree view over the city. "There's a kind of panorama over the physical London as well as the panorama of the digital London," said Matsuda. The Prism structure has an aluminium frame covered in Japanese paper and had to be extremely lightweight since the whole thing is only supported by steel braces against the cupola walls; drilling into them was out of the question. The tip of the Prism hangs down into an atrium and can be glimpsed from several storeys below at the entrance to the museum. 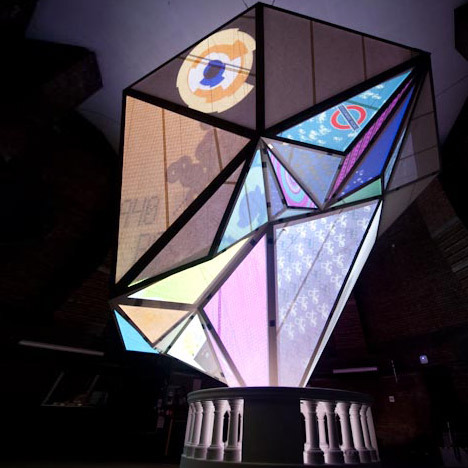 Entrance to the installation in the V&A cupola is by timed tickets, available here, until Sunday 23 September. Meanwhile, on the other side of town at the Andaz Liverpool Street hotel, a cabinet designed by Studio Swine in collaboration with Matsuda contains a hologram of the Prism structure, so visitors without tickets to the large installation (or those who are uncomfortable with the narrow stairs that lead to it) can still see the data streams visualised. Photographs are by Susan Smart. Matsuda talks to Dezeen editor-in-chief Marcus Fairs about the project in the audio clip below. The London Design Festival continues until 23 September and you can see all our stories about it in our special category. The map above is taken from Dezeen's guide to the London Design Festival, which lists all the events going on across the city this week. We'll be updating it over the coming days with extra information on our highlights so keep checking back. Explore the larger version of this map here.